When you’re out on the road every single day, there are many potential dangers lurking. If you aren’t prepared for dealing with the very many usual dangerous occurrences, then you’re setting yourself up for an accident and the hassles of car damage. 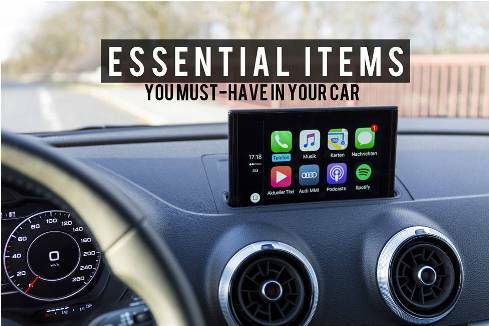 Save yourself some money and a trip to the Car Service and make sure that you are aware and stocked up on the essential items that should always be in your car are essentially tools that adhere to repair or maintenance type concerns. First of all, have a Spare tire set aside in your car at all times –that’s a given. Keep a Tire pressure gauge especially for long road trips, and make sure to keep track of your tire’s air at Make sure you always carry Duct tape in case you’re in need of any temporary solutions for any sort of internal or external cohesions. Keep Jumper cable with you at all times because in the event that something goes wrong with your battery, you’re going to need a means for jumpstarting the engine. Stock a few liters of Water bottles with both distilled and tap water because if ever your radiator overheats, you’ll need substantial amounts of water to remedy the situation. Always store an Empty gas can in case you run out of gas without a nearby gas station in sight. Store your Car manual in the glove compartment, you’ll never know when an occurrence would pop up wherein you’d need specific instructions that only the pages of your manual can provide. Store some sort of a First aid kit with you. Flashlight as a visible tool for night time scenarios or even for when inspecting the darker regions of your engine. Keep Reflective triangles especially when you’re driving through a highway because when an event calls for you to stop and park right on the edges of a highway, you’ll need a visible notifying sign to inform approaching high speed vehicles that you and your vehicle are on the side of the road. Stock Cardboard in cases wherein you need to inspect something underneath your car. Set aside an Umbrella in any event of rain. Store a Pen, Pencil, and paper in your glove compartment for any affair that calls for you to take note of something and write it down. Keep a modest amount of Money and Spare change with you for emergencies that require immediate monetary subsidy or simply for convenience when you’re passing through toll gates and need to pay exact change. Finally, make sure you have a spare phone charger for communication. Despite all the cautionary sentiments having just briefly run through, in the event of any relatively severe emergency on the road, there are Car Services that immediately respond and are well trained in those scenarios. Hone your responsibility of car ownership to yourself and to your passengers by making sure that you have all of these items covered to ensure always having a smooth and hassle free drive.